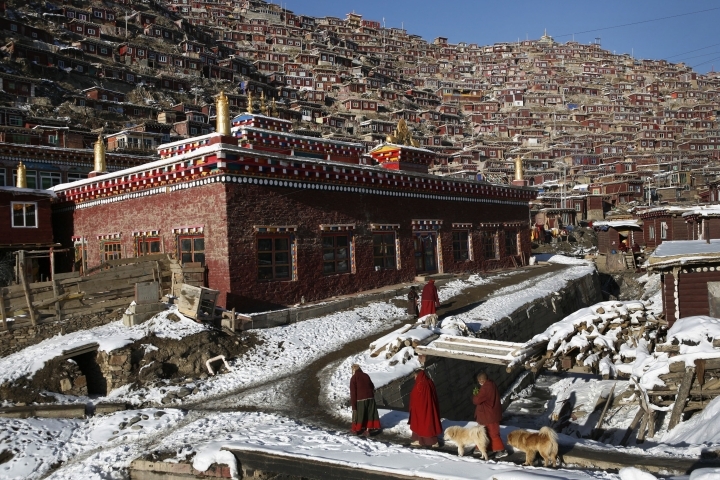 BEIJING — China is rebuilding a major center of Tibetan Buddhist learning in the country's west to improve safety and public health, a local official and state media said Tuesday, refuting reports last year that the complex was being demolished and its residents evicted. The sprawling Larung Gar complex had been home to thousands of monks, nuns and laypeople studying the religion's more esoteric aspects. Overseas monitoring groups said last year that buildings were being torn down in an apparent attempt to drive off those staying there. However, county government spokesman Jiang Zhiming told The Associated Press that only some buildings had been razed to clear access lanes for firefighters. He didn't say how many Buddhist faithful remained at the site, but said about 800 had been resettled in a nearby town. "The purpose of the renovation is to improve the living standard of the residents there and eliminate fire hazards," Jiang said. Work began last May and will finish this month, he said. Along with the seminary and temples, the site included a settlement made of thousands of log cabins lining the steep sides of a valley that provided accommodation for residents and visitors attending short-term study courses. Built in 1980, the seminary had hosted around 4,000 people, but was designed "haphazardly" and grew over the years "without regard to geological risks" in the seismically active area, the official China Daily newspaper said. Government teams previously evicted thousands of monks in 2001, but the site has swelled significantly in the years since. A fire in 2014 had destroyed about 150 dwellings but caused no deaths or injuries, China Daily said. The seminary is located in Sichuan province's Sertar county, a remote mountainous region largely off-limits to foreign media. Information from the area is almost impossible to verify. Access to traditionally Tibetan parts of western Sichuan has been restricted since anti-government riots swept across the region in 2008 and reporters who make it to the area are usually detained and sent back to the provincial capital. More recently, the area has seen a wave of self-immolations by Tibetan clergy and laypeople protesting government suppression and calling for the return of the Dalai Lama, the exiled Tibetan spiritual leader. Also Tuesday, state newspapers quoted China's hand-picked Panchen Lama, the second-highest figure in Tibetan Buddhism, calling for stricter regulation of Buddhist temples and clergy, including "fake monks." "Buddhism has suffered the effects of commercialization. Some monks were not following religious disciplines and have been seeking financial gain in the name of religion," the Panchen Lama said in his first speech ever to the Chinese People's Political Consultative Conference, the official advisory body to China's ceremonial parliament. China picked its own Panchen Lama in 1995, rejecting a boy chosen by the Dalai Lama, who fled Tibet in 1959 amid an abortive uprising against Chinese rule.